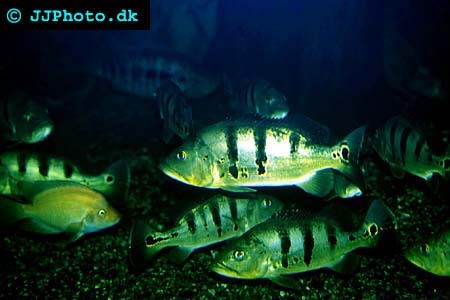 Cichla is a group of South American cichlids that are found in rivers in Guyana, Venezuela, and Brazil . They all have elongated streamlined bodies and large mouths. Their body shape makes them very easy to distinguish from other cichlids from the area. All Cichla species are highly predatory and grows large or in some cases very large. The fact that the are large and highly predatory doe however not stand in the way for Cichla species to be very interesting aquarium fish species that can kept in breed in aquarium as long as you give them the right conditions. It is unknown exactly how many Cichla species there are since new species or perhaps sub species are found on a regular basis. Cichlas are the largest cichlids that are found in South America. The largest know species is Cichla temensis which is believed to reach 1 m / 40 inches. You need a large aquarium or even better a pond if you want to keep adult and you should avoid getting Cichla species unless you can offer them an aquarium of at least 540 L / 130 gallon when they grow larger. They should however preferable be kept in aquarium of at least twice that size. Cichla species need warm water and should be kept in aquariums with a water temperature of 23-28ºC (73-82ºF). The pH and water hardness levels are less important since these fishes are very tolerant to different conditions as long as extremes are avoided such as pH levels above 8.0. They produce a lot of waste matter so a well circulated aquarium and regular large water changes are a necessity. A Cichla aquarium should be decorated with large rocks and roots to offer hiding places. A number of large robust plants are also to be recommended. The roots and rocks should be placed directly on the bottom glass to void that the large fishes tip them of and causes the glass to crack. Cichla species are excellent jumpers and often jump out of the water if they get spooked so a well covered aquarium is a necessity. Cichlas are piscivorus and prefers live food but can be trained to accept chopped fish, meat and even pellets. Cichla species chase down their prey rather being ambush predators like most other predatory cichlids from the area.